It’s nearly impossible to read about or view sea otters without encountering the word cute. Their looks and antics tap into an oh-that’s-so-cute human emotion. And, according to Konrad Lorenz’ Kindchenschema principle — a certain set of child-like facial and body features make a creature appear “cute” activating our motivation to care — they are cute. Responding in this manner is important when responsible for a child, as well as useful when trying to save the planet — images of playful pandas, wide-eyed seals and cuddly baby anythings help by attracting people to the cuteness and then (hopefully) engaging them in the conservation cause. Cute sea otters (I’ve used the word enough now to stop) are important players in a long California conservation story with a still-uncertain ending. 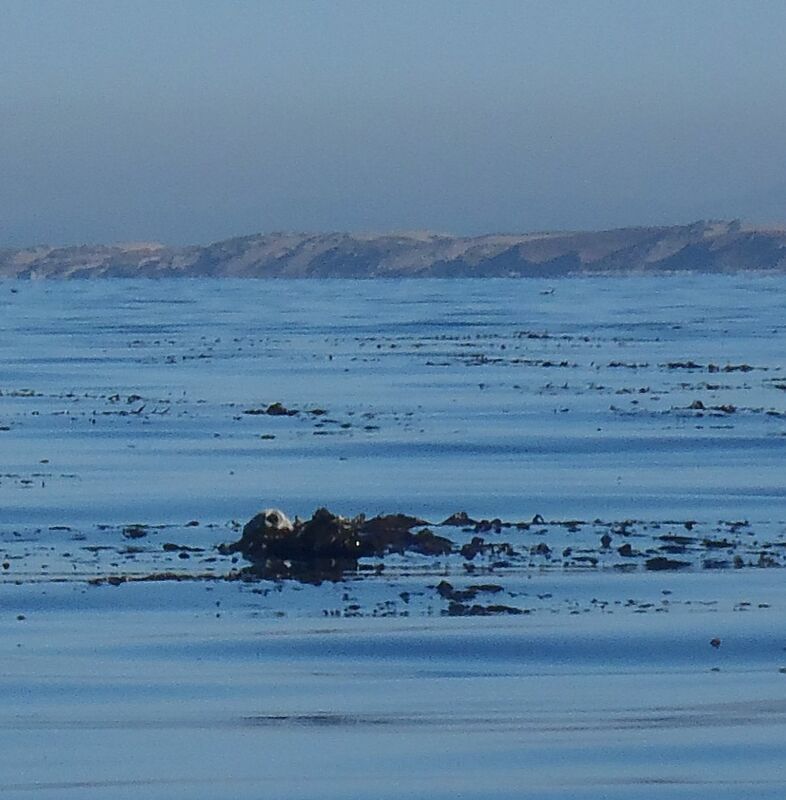 As I kayak, this is my typical view of sea otters: more like distant logs than plush toys. But this is a good thing. The southern sea otter (Enhydra lutris nereis), which is the subspecies found along the California coast, is listed as a federal threatened species (the IUCN, however, lists the species as endangered). Both listings are due to the small population (not as low as in 1911 when they were first protected or 1938 when fewer than 50 were spotted off Big Sur, but still much lower than any historic high). Getting too close to them these days is not only illegal, but detrimental to their recovery. And they’re recovering from a long list of threats: past hunting, habitat destruction/degradation and conflicts with fishing practices to current toxins, parasites, infectious diseases, potential oil spills (due to their concentrated range) and, more recently, shark “tasting” bites. 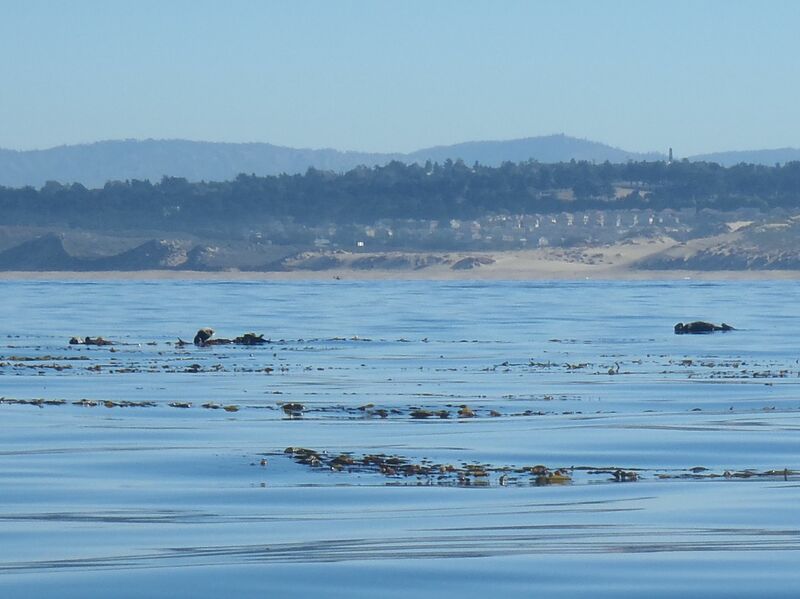 Sea otters appear common in Monterey Bay — I see them every time I kayak the kelp beds off Cannery Row or in Elkhorn Slough. However, there are concerns that the population growth is sputtering. According to the Sanctuaries’ SIMoN website, annual sea otter counts since 1999 have been “quite variable, with a slight trend towards increase over the whole range.” The census numbers released in the summer of 2012 by the USGS noted a population of 2,792 individuals, an almost 2% increase since 2010. But some years that number goes up and some years it goes down. And no matter how you count it, that’s not very many animals. Many think the sputtering population growth is due to high mortality caused by the long list of current threats (see above) and that sea otters have pretty much exploited the Central California coast, hence their range needs to expand. In fact, some sea otters (typically young males) have been trying to expand the range for years and have been thwarted by the federal government. The feds have now come to the conclusion that range expansion is also key to sea otter recovery, and, effective January 18, 2013, will no longer interfere with the movement of California sea otters. According to their final rule, they will “allow southern sea otters to expand their range naturally into Southern California waters.” This could be devastating for some in the fishing community (each sea otter consumes about 25% of its body weight each day eating crabs, abalone, sea urchins, clams and other valuable commercial species). But there’s good news here, too. It’s good news for sea otters, for kelp forests and for those who rely on coastal kelp beds economically and recreationally. By eating kelp grazers (urchins in particular), sea otters enable kelp forests to flourish, and healthy kelp forests create habitat for many other marine and bird species. Urchin-munching may also help mitigate climate change according to a 2012 study (Wilmers et al) of the northern, or Alaska, sea otter (Enhydra lutris kenyoni). By eating sea urchins, sea otters indirectly encourage kelp forest growth, and kelps grow by pulling carbon dioxide (a global warming gas) from the atmosphere. The otters’ environmental work was valued in this study at U.S. $205 million to $408 million on the European Carbon Exchange. Impressive numbers. So by protecting sea otters (based on cuteness, environmental, climate or other factors), we’re preserving kelp forests, and maybe saving ourselves.